4th October 2014 - 13/05724/OUT or 13/05269/FUL? It will be seen that area A19 etc (top left) is not within the 'Application site boundary' so no permission has yet been obtained (according to Wilts CC's online documents) for development in this area. Also, as stated in the 2nd October 2014 article below, no relevant (full) permission has yet been applied for or obtained for planning application 13/05724/OUT. See photographs below on the 'state of play' in this area on Friday afternoon, 3rd October 2014. Outline planning permission was granted for planning application 13/05724/OUT at the Northern Area Planning Committee on 14th March 2014. No subsequent full application has since been submitted or approved. However, earth movers and JCBs have been on-site since Tuesday, 30th September seemingly preparing the site! On receipt of photos of on-site activity, the planning officer invoked 'enforcement' which, apparently, is a long, drawn-out process - we will have to wait a while for the verdict. If this activity is deemed to be outwith the planning process, I trust this will be taken into account when full planning permission is eventually requested. Also, I trust that all can plainly see the good, loamy earth (unusual for this area) that the planners have condemned to be tarmacadamed. And all this for unnecessary, speculative development which has been fought against vehemently by locals (see previous articles). Rudloescene will continue the fight against development of this pastureland. See the following, 4th & 8th October articles for clarification (or otherwise!) of what's going on here. Sunset for the farmland twixt Rudloe and Pickwick? The leaflet, reproduced below in the two 'links', has been distributed to households in Bradford Road and perhaps elsewhere. The proposal is sketchy but appears to incorporate a slope shaft at the north-western end of the field (close to the pylons pictured, which is a rather odd choice for industrial activity). The rectangular 'blocks' on the plan are, apparently, for machinery storage and 'welfare' (a tea hut?). The 'track' along the eastern and southern edges of the proposed development is a mystery at present (I have called Paul Williams, as suggested on the leaflet, but there was no one at home). The leaflet has a paragraph "Who will be affected?". This states that properties fronting the A4 (to the east of the development) and properties to the west (Toghill Crescent and Long Close Avenue) will be most affected. 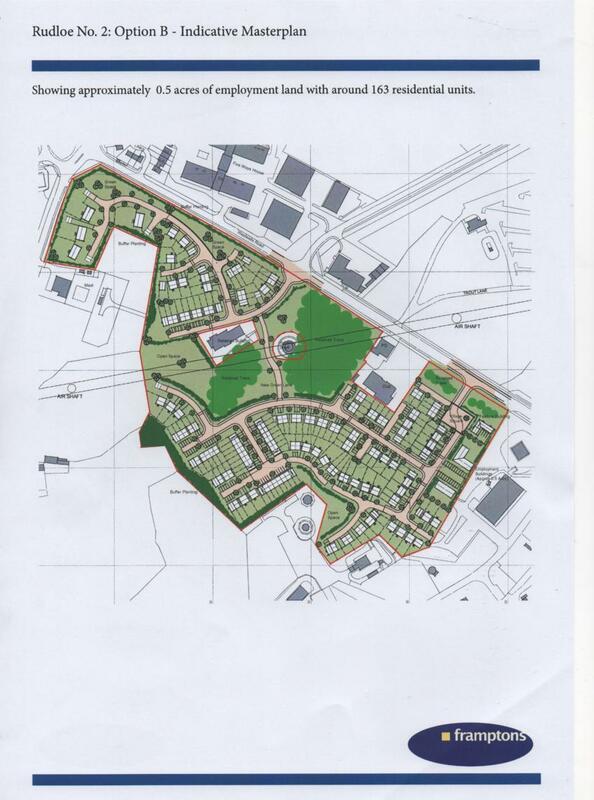 However, the leaflet also says that the development will be 400 metres from Rudloe Estate so I would have thought that properties to the south, fronting Bradford Road, would be more affected than those at Rudloe Estate. A 2.4 metre fence is proposed - not a welcome sight in what is now the last remaining bit of farmland without a development proposal between Rudloe and Pickwick (see pictures below). The rationale for the new entrance appears to make little sense as the leaflet says that the old entrance is now one mile from the present working face. However, using Daft Logic and Google Maps, the approximate site of the new entrance is calculated at 0.35 miles from the old entrance (see Google Map below). In the unlikely event that the current working face is also somewhere in this direction (but I don't think it is) then a new entrance here would have only a marginal effect on the 'distance problem'. At the specially-convened Box Parish Council (BPC) meeting last Tuesday, 15th July, to discuss the proposed annexation of Rudloe, Hawthorn, Chapel Plaister and Wadswick by Corsham Parish Council, we were told that BPC is responsible for maintaining the grass verges and keeping footpaths clear of weeds at Rudloe (and elsewhere in the parish of course). I haven't looked at the books, but I would imagine that with personnel, truck, equipment etc, this must cost Box ratepayers a pretty penny - perhaps £50k per annum (with capital costs spread over a number of years). Just concentrating on Rudloe, this 'service' appears to be BPC's sole contribution to our 'well-being' (apart from selling the community down the river by supporting greenfield planning applications). So what do we get for our money? 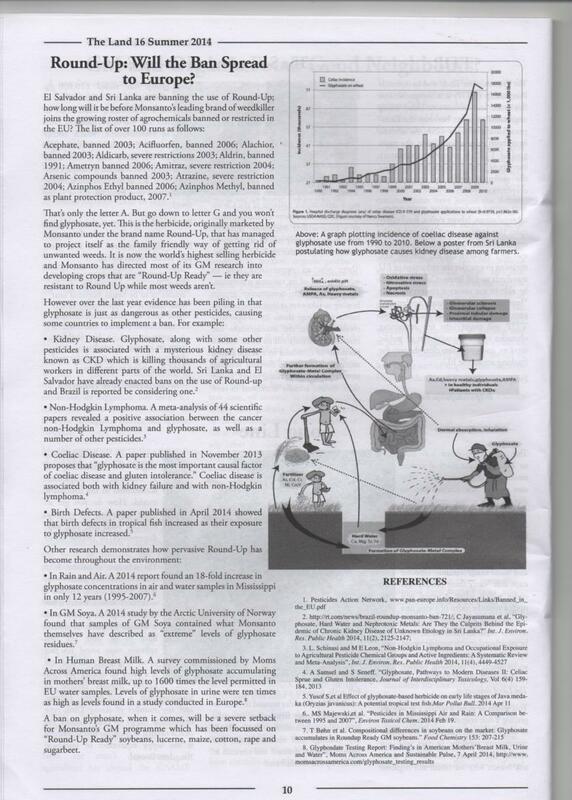 An article in the 'News' (general news) on this website discusses the 'mystery of the disappearing tree' in Leafy Lane. It appears (but I may of course be wrong) that BPC is responsible for this verge and ergo the felling of this tree. I was reminded of the former tree (a sycamore) by the aforementioned verge maintenance which was taking place this week. The sycamore stump is still alive and is 'coppicing' (see photo). If left to its own devices it would form an attractive shrub (similar to the coppiced limes at the A4 end of Leafy Lane). In fact it was doing just this when our fine BPC maintenance team shredded all the coppicing stalks (see photo) this week. I would dearly love to know why BPC found it necessary to fell the tree in the first place (presuming this is the case) and what it holds against its fight for survival. Does BPC find dead tree stumps particularly alluring? This same 'team' is, I guess, responsible for maintaining the pathway adjacent to our back garden. Along this path, I have, over many years, attempted to 'cultivate' centranthus ruber (red valerian) in order to provide an attractive verge. So what does BPC maintenance do - cut the lot back so ensuring a fine tarmac experience. Why is BPC spending 'our' money to the detriment of the environment (I have written in the past but will, again, write to them about this and point to this article)? Perhaps, as with most people in public office, they have to be seen to be doing something (anything) to justify their existence. My preferred option is do nothing, stop wasting our money on unnecessary maintenance or alternatively bring back the kind of service provided by Geoff and before him, Larry. Below are the before and after images of the sycamore in Leafy Lane (a picture of the tree itself is included in the article on the general 'News' page), a 'video' of the racket made by the BPC maintenance man in destroying our red valerian and an article from this summer's edition of The Land which discusses the potential dangers of the supposedly safe glyphosate (Roundup) and a possible link with, inter alia, coeliac disease. This is the outline planning proposal we (locals) have been waiting for. Whilst speculative developers (Gladman, Hannick and Redcliffe) and avaricious landowners have been jumping at Government's current planning free-for-all and producing outline proposals to swallow up farmland twixt Pickwick and Rudloe, Frampton's (planning consultancy) is delivering outline plans for two of the local brownfield sites (Copenacre and RAF Rudloe No 2 Site). These brownfield sites, and their proposed 270 homes, will be developed sooner or later so, in my opinion, we have to accept the pressure on local services and the road system that these developments will, no doubt, bring. What we do not have to accept is the undue pressure that further unwarranted development on greenfield sites in west Corsham will presage. Thankfully, Wiltshire planners have refused the Gladman proposal at Pickwick but have, foolishly (in my opinion), approved the Hannick proposal for 88 homes and speculative commercial premises. Approved, ostensibly and short-sightedly because brownfield proposals are too long in the pipeline. This is yet another example of British short-termism - "let's not be prudent and judicious in terms of getting the right result for our communities, farmland, services, the road infrastructure and so on - let's swallow up greenfield because of the mad panic (from Government) to get the economy moving (and by doing so, to get re-elected)". The 'mad panic' also purports to resolve the supposed (see Danny Dorling's All that is Solid - subtitled 'The Great Housing Disaster') housing crisis. Housing is in crisis - one of the, if not the, basic requirements of a member of civil society is to have an affordable roof over his or her head. The 2013, Wilts County Council Rudloe Housing Needs Survey found that 74% of Rudloe households had an income of less than £20k and that the average price of a 2-bed home in Rudloe was £174k - this seems to high to me, so let's say £150k for the sake of argument. Such a 'basic', home is therefore at a multiple of 7.5 (or thereabouts) times the average (max average at that) Rudloe wage. In addition the Housing Needs Survey found that 78% of households had no savings - yet the transaction above would require a deposit of £22k (or thereabouts). The housing market, as Danny Dorling says is "a disaster" for ordinary, working people. Back in the seventies, when building societies were 'mutuals' and prudent, two-and-a-half times salary was the affordable amount needed to buy a 2-bed 'starter' home (ref our first home in Priory Street). But now, investment in housing for profit with under-used or unused second- and third-homes (particularly in London), the Help to Buy scheme and so on keep the housing market unaffordably high (ridiculously so). Whilst lenders have started to apply more stringent tests regarding borrowers' ability to pay (as they should have been doing all along anyway), the coming interest rate rise (foretold by The Governor of The Bank of England) will bring another 2007/8-type crisis with households unable to keep up repayments. 'We' (the banks) appear to have taken no lessons from 'The Crash' - business and bonuses as usual is the order of the day with, undoubtedly, another crash (and more bailouts) next year, most likely after the general election. 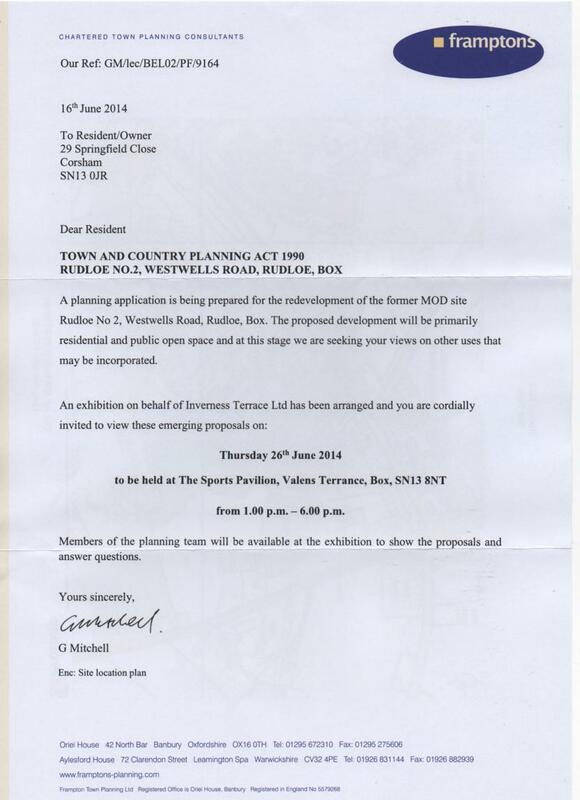 Residents of Rudloe and perhaps beyond, today received a notice through the letterbox from planning consultants Framptons regarding a planning application for RAF Rudloe Manor No 2 Site in Westwells Road. The proposed development will be primarily residential. The last I heard, 200 homes were mentioned. There will be an exhibition of the proposal on Thursday 26th June at The Sports Pavilion, Valens Terrace, Box from 1pm to 6pm. See file links below for further details. See now the 29th June article above with the outline proposal(s) for the site. At last, a substantial proposal on a brownfield site that locals can support - this is the site that 'we' asserted should be supported over the Hannick and Redcliffe proposals which will consume farmland twixt Rudloe and Pickwick. Copenacre from the northern edge of Rudloe, near a 'renaissance' site! The developers of the Copenacre site have put in a 'variation' of the original plan which, amongst other things, shifts the retirement home to the western corner of the plot, adjacent to the A4. The proposal also includes up to 94 dwellings. The planning application is 14/03958/VAR and the deadline for comments, observations or objections is today! Clearly I am rather late in reporting this but late comments have been allowed in the past (for other planning applications) so I would assume that they would also be allowed for this application. The photo shows the 30-acre field, planted to miscanthus for many years, 20 acres of which are the subject of the Redcliffe Homes planning application 14/04179/OUT for 170 homes and a medical/community centre. In the current environment, where it seems that there is an imperative to build almost anywhere at all costs, one wonders whether it is worthwhile mounting another campaign to try to stop this development. With 88 homes and commercial units already approved at Rudloe, the Rudloe 'renaissance' of 11 homes by Green Square, the 17 homes under construction at Spring Tynings, future homes at the police station and library sites, 150 homes and a commercial unit at Pickwick, 94 homes and other development at Copenacre, 170 homes at the ex-RAF Rudloe No 2 site in Westwells Road, Corsham will move from a "quiet, unspoilt market town" (from the Visit Wiltshire website) to a damned great conurbation. I guess that the rationale of our planners may be "well, we've ruined Chippenham, Melksham, Trowbridge and Westbury, let's now start on the smaller towns". We don't ever seem to learn the lessons of history: we rue our lost railways and our town centres which have been sacrificed to the tyranny of the motor vehicle; we lament the planning disasters of the 60s and 70s with their menacing tower blocks and the destruction of fine Georgian and Victorian architecture. Now our beloved Government and planners have a suicidal desire to raze our greenbelt and farmland. I think this was called 'Localism' at the outset of this Government's five-year term. The headline figure is an estimate but it cannot be far from the true sum. Unless we locals are missing something, the remodelling of this junction will make all aspects of passing through or turning here much more problematic. For the people of Rudloe who have used this junction since the building of the Rudloe estates in the 60s and 70s, there has never been any problem here. Personally, I have used this junction with cars, service and National Express buses over forty years and the only problem I have (recently) encountered is that some service buses on exiting Leafy Lane 'bottom out' because of the dip on entering the A4. As far as locals are concerned, this junction was not one of the road 'issues' in this area. With the new junction, the westbound exit lane from the A4 into Leafy Lane has been removed. Vehicles making this turn will now have to brake and slow down in the main traffic lane thus hindering the passage of following vehicles which will also have to brake and slow down. But the situation is even worse for eastbound traffic. The inside/bus lane has also been removed. With the 'old' layout, through traffic could pass on the inside of vehicles turning right into Leafy Lane but now all eastbound traffic will have to stop behind turning vehicles. CORRECTION - I was a bit 'previous' with this statement. It didn't seem possible before the white lines were painted, but an inside 'passing' lane has been included here. The westbound slip road has also been removed so buses exiting Leafy Lane will have to make a contorted turn to exit Leafy Lane and, if passengers wish to enter or alight the bus here, slalom back into the new lay-by. CORRECTION - this manoeuvre doesn't appear as awkward as I first thought. Similarly, the new eastbound bus lay-by appears to be shallow - buses stopped here may also cause traffic hold-ups. Road users managed this junction, in its old form, perfectly well. Why then has Wilts County Council seen fit to mess with it, unnecessarily, at great public expense? CORRECTION - apparently, the remodelling has resulted from traffic accident statistics here. I will endeavour to find (and publish) those stats in order to discover the rationale behind the remodelling. Who needs biofuel when we can have concrete and tarmac? Here is the news that we perhaps expected - a development proposal now for the remaining land between Pickwick and Rudloe from Redcliffe Homes. Pickwick and Rudloe will become as one! This is North Wilts constituency, so James Gray's patch. Unusually, I am lost for words at present. Following a meeting of Rudloeites (and one Pickwickonian) at The Hare & Hounds last night, I was just starting to compose my 'three-minute' stand-up routine for the Wilts CC planning meeting on 19th February (where the Hannick Homes speculative Bradford Road development 13/05724/OUT will be discussed) when this 'blockbuster' news arrived by email. With the 450 homes and 2.33 hectares of commercial land at Hunters Moon (land just south of Methuen Park South) having just been approved in spite of the Wiltshire Workspace and Employment Land Study (the Tym report) stating that Hunters Moon was: "not deliverable", "not developable" and "a poor site - particularly with regard to visibility for businesses, local access roads and topography", local communities are under attack (from central government, landowners and developers) as never before. The Hunters Moon development is in Corsham Parish by the way. Now we have this new Bradford Road speculation. Keep calm and carry on? This isn't doing my blood pressure any good. 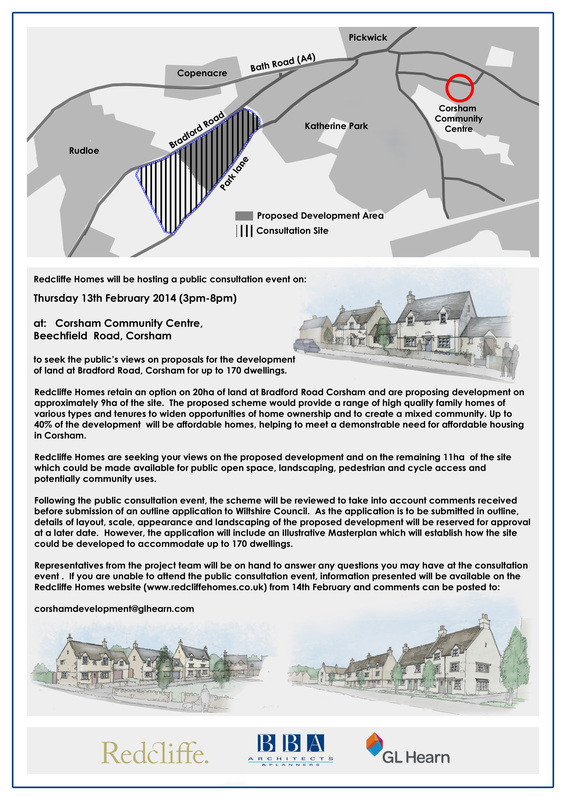 The public consultation notice for this Redcliffe Homes development is shown in the file below. It will be held at Corsham Community Centre, a week today, on Thursday 13th February from 3pm to 8pm. People will be searched for concealed weapons at the door. At 11:10 am, the driver of a large, industrial drain-cleaning vehicle lost control while travelling east along the B3109, Bradford Road and ploughed across the grass verge behind the Toghill Crescent bus stop. The X31 bus had just stopped in front of the vehicle so perhaps its brakes weren't good enough to avoid a collision with the bus? The vehicle careered over the grass verge knocking down a few small branches and came to a halt in Toghill Crescent. Just seconds before, people were standing in the vehicle's path but they had moved forward to catch the bus! The driver reversed the vehicle out of Toghill Crescent into Leylands Road and then dismounted from the cab to inspect the rear nearside. Meanwhile a Landrover, which had been accompanying the vehicle, waited in Bradford Road and then reversed to the bus stop when traffic had passed. The two vehicles then resumed their journey east - with brakes this time hopefully! The text below is similar to the 7th December 'Pickwick' text; the same issues apply! This speculative development, like the others at Wadswick and Pickwick has caused and is causing the local community much anguish. A great deal of time and effort has been expended at meetings and in leaflet production and distribution. The landowner? What does he have to say in this debate? Absolutely nothing it seems; he just lights the blue touch paper and watches the local community agonise over his decision to sell-off his land to speculators. Locals who, through their taxes, have helped subsidise the farmer to the tune of £324,000 (at today's exchange rate) between 2000 and 2009 (no later figures available). The farmer who enjoys tax breaks, pays no council tax, no VAT, no fuel duty and no inheritance tax is able to sell the local tax-paying community down the river. Great system we have! See the 'Pickwick and 'Wadswick' pages for the subsidies received by those farmers (the 'Wadswick' subsidy can be found in my objection letter to the solar park). The planning application from Hannick Homes for the development of land south of the Bradford Road at Rudloe has been registered and published by Wilts County Council. The application number is 13/05724/OUT. In order to view or download the documents, go to: http://planning.wiltshire.gov.uk/Northgate/PlanningExplorer/ApplicationSearch.aspx and enter the application number given above. A leaflet, which will be distributed to 700 homes at Rudloe, Hawthorn and Pickwick can be found at the link below. The promised 'paper' (ref 6th October article), as with the promised public meeting, has not materialised - apologies! Two things have happened though as per the following paras. 1. Hannick has stated that the planning application will be published this week so keep an eye out for that (although it may take a week or so for Wilts County Council to process and publish it). 2. Wilts CC Spatial Planning Department has stated that the former RAF Rudloe No 2 site in Westwells Road will be released (for development) in this financial year, that is within the next six months. I believe that item 2 has major repercussions for the proposed Hannick greenfield development. The former RAF brownfield site is just a few hundred metres from the Hannick greenfield site so why develop greenfield? The former RAF site is substantial and has, potentially, more than enough space for a development on the scale of that proposed on the Bradford Road. This depends, of course, on what is released by Defence Infrastructure (formerly Defence Estates) at this site. The illustrations in the files below show the scale of the proposed Hannick development along with two potential areas within the former RAF site. 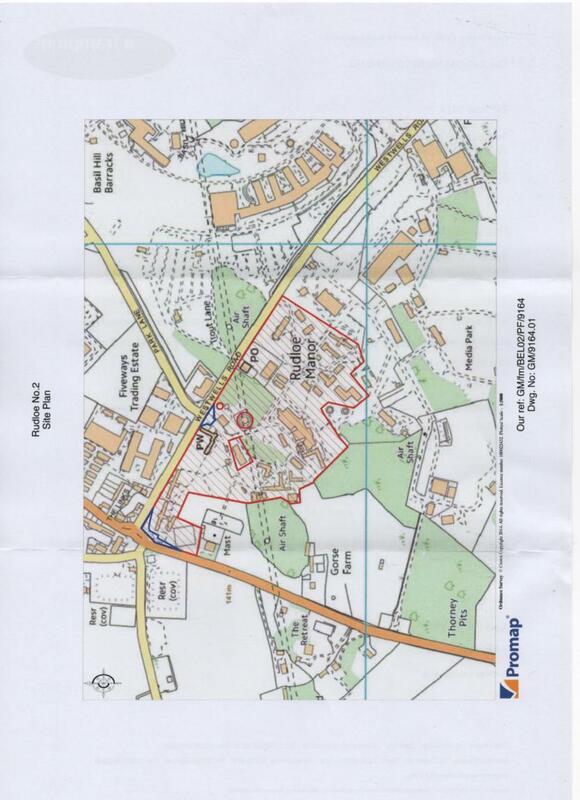 The part adjacent to Westwells Road, I have called 'RAF Rudloe Manor - possible development area 1' - this is 2.61 hectares or 6.41 acres; the other part 'RAF Rudloe Manor - possible development area 2' is 7.25 hectares or 17.92 acres. The third illustration is the proposed Hannick greenfield development at 5.01 hectares or 12.37 acres. I reckon that the 'RAF area 2' would make a fine housing estate with woodland all around and away from the main roads; 'area 1' could perhaps be used for the speculative high-tech commercial development by Bath ASU. However, this is pure speculation until we know what will be offered for sale by Defence Infrastructure. But what we do know is that this site will be developed sooner or later and if the greenfield development is allowed to proceed, Rudloe/Hawthorn will suffer from over-development. Having now taken a bit of time to view Hannick's development proposal (as seen at the 30 September 2013 exhibition), not much makes sense. I will write and attach a 'paper' (too much to say to just put the text straight onto this page) in the next few days but just to give a flavour of their crazy proposals - 150 car parking spaces for 2/3-bedroom homes; 39 (estimated) car parking spaces for 4-bedroom homes; 12 spaces for the school; total - 201 spaces for the residential area plus the roadways! And they say: "an additional 50 vehicle journeys in the morning/evening rush hours" - 50 journeys for 201 car spaces! What about the other 151 cars - will they just be parked up all day? In addition, the 'speculative' commercial area has 104 parking spaces. So, a total of 305 car parking spaces for this 'sustainable', '40% social housing' development whilst across the road in Rudloe Estate, GreenSquare proposes to increase housing density by replacing existing garages/parking with housing. Watch this space - more to come ..... but just one more point below. Hannick’s exhibition material indicates that their “ghost island right turn lane” will necessitate a 3-metre widening of Bradford Road. The only way to achieve this will be to remove all the trees that currently shelter the west side of the proposed development site. A ‘map’ of these trees is shown below; it starts at top right, at the cottage, and runs through to the bottom left and shows the major middle-aged trees with underlying shrubs consisting mainly of blackthorn and clematis vitalba (old man’s beard) and some blackberry. I have never seen such sloes (blackthorn) – they are plum-sized (see pictures below). Pictures 4, 5 and 6 show the trees and field last Sunday, 6th October, and the final six pictures are some views of the threatened trees at different times of year. Hannick's representatives and their notices and questionnaire make the assumption, of course, that their development is the only/best option for the the homes required in the wider Corsham area over the next 13 years. But our neighbourhood's future should be decided by a strong, long-term plan/strategy not by quick-buck deals between landowners and speculative developers. Note that the 475 figure is for 'Corsham Town'; apparently as Rudloe could be taken as providing homes and employment for Corsham, it could (!) be included in this figure (however, as all are trying to maintain the 'strategic gap' between Corsham and Rudloe, I would say that Rudloe should be 'Remainder' not 'Corsham Town'). Whatever the ins and outs of this argument, Wiltshire County Council's Spatial Planning Department have, last week, stated: "the 475 figure has been reduced by permissions for developments at Royal Arthur (a renewed permission) and Copenacre. And as such the figure is now closer to 150. The Council will need to continue to take a view when/if an application comes in as to whether development in and around this area should be viewed as Corsham Town or Corsham Remainder." So, 150 homes required in 'new' developments in the wider Corsham area over the next 13 years! The ex-RAF Rudloe No 2 site in Westwells Road could provide all of this requirement. Both Ms Morgan and Ms O'Grady are senior town planners. Their comments should be given serious consideration by Wilts County Council if and when greenfield planning applications (including the Hannick proposal) are submitted. Hannick's display posters and questionnaire are shown below; click on the PDF icon below to see the posters and on the images below that for the questionnaire. Isn't it ironic that in the same month that the Rudloe Community Centre bar closes after 64 years, Marco Pierre White opens 'The Rudloe Arms' - a new appellation for Rudloe Hall Hotel. Much refurbishment is taking place there: the bar (see pics) has an American feel but with British pub games - bar billiards and table football alongside the pool tables and juke box. Much more is to be done too. I just went in to take a few pictures but after the guided tour by maitre d' Mark, got chatting to a couple from Dorset and ... three pints and a couple of hours later, we'd put the world to rights. It's dearer than Rudloe Community Centre that's for sure (e.g. Corona is £2.70 at RCC but £3.85 at the Arms) but what's a few extra quid for a good afternoon/evening out. After almost 64 years, the bar at Rudloe Community Centre (RCC) will close at the end of September. The community activities (Tuesday afternoon club, Wednesday bingo, Thursday choir etc) will continue for the present but the bar closure could lead to the complete closure of the Centre. "As early as 2006 it was identified that the RCC was not able to function as anticipated. This was considered at the time to be partly due to the design of the building. It was also considered that the community rooms were too small. This contributed to a worsening financial situation for the Rudloe Community Association." This is just the general background to the present bar crisis. In the current financial climate, it seems that people can no longer afford to spend on going out as they did in the past. It isn't too late to save the bar and the Centre itself but the bottom line is that local people must make a conscious decision to use it. Update - the bar closed on Sunday 29th September 2013 and yours truly won £10 in the raffle! Certainly a black day for the Rudloe community with the 'Town' bus service also being lost. Phil Beattie shown below during the final booze up - next round in the Rudloe Arms. The planning officers responsible are Chris Marsh and Simon Smith. The meeting/exhibition will be held at Rudloe Community Centre from 3 p.m. to 7:30 p.m on 30th September. All members of the public with an interest in this development are invited to attend. If you read the 'Rudloe Renaissance' part in the last section of the website, it seems to me that GreenSquare is being markedly patronising in its attitude towards Rudloe Estate and its residents. My response to GreenSquare's plans can be found below. Hannick Homes of Swindon (http://www.hannick.co.uk/) held an exhibition at Rudloe School, on 22 June, of a proposed development on the Bradford Road (opposite the school) for 80+ homes and a commercial/office development. My initial response (pre-planning application) to the Hannick proposal can be found below (this is repeated from the 'News' title page). Title photo shows the site of the proposed Rudloe greenfield development. Fine views here of the Marlborough Downs and the escarpment around Oliver's Camp. Photos below show 'haymaking' on 20th July.